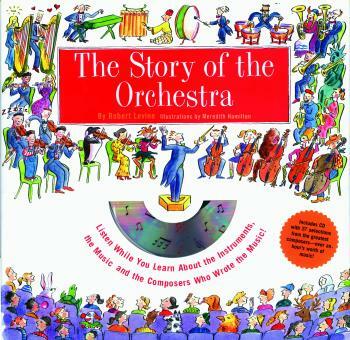 Eye-catching illustrations and an accompanying 70-minute CD make this an exciting and educational introduction to the world of classical music-from composers and music history to the instruments of the orchestra-for elementary age children (and parents, too!). The stories of famous composers from Bach to Stravinsky. An explanation of different musical styles from Baroque to Modern. Each step of the way, children can listen to actual musical examples of what they are learning about. Young readers will hear the sound of an actual violin as they study the instrument and enjoy the playful tune of a Mozart minuet as they read about the composer's precocious exploits as a child. Join Orchestra Bob on this fun and exciting musical journey. Perfect for young students just starting to play an orchestral instrument as well as for parents and teachers looking for a simple introduction to the principles and history of classical music. Author Robert Levine is an internationally known music and travel writer whose work has appeared in dozens of publications. He was the co-editor of Records' Classical Pulse! Magazine, helped launch and was the Senior Editor-in-chief of Andante.com, a world wide web site devoted to every aspect of classical music and musicians. He attends his operas and symphonies in New York.